BURBANK, Calif. -- From an overnight stay inside Cinderella Castle to a Golden FASTPASS, dreams big and small will come true at Disneyland and Walt Disney World resorts during Disney's "Year of a Million Dreams," a first-of-its-kind celebration of the individual dreams of Disney Parks guests. The year-long celebration, beginning Oct. 1, 2006, at Disneyland Resort in California and Walt Disney World Resort in Florida, will feature the debut of an incredible lineup of new attractions and entertainment at both Disneyland and Walt Disney World resorts, plus new technologies that allow guests to customize their Disney park experience. 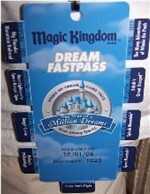 And, for the first time, during the "Year of a Million Dreams" celebration, Disney cast members will award a million dreams -- both large and small, including many "money-can't-buy" experiences -- to guests selected through a random process as part of a unique "Disney Dreams Giveaway" promotion. "Throughout this incredible celebration, special dreams and unique experiences once thought impossible will be awarded by our cast every day," said Jay Rasulo, chairman of Walt Disney Parks and Resorts. 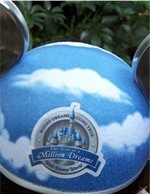 "Disney parks are always the place where dreams come true -- but even more so during the 'Year of a Million Dreams.' 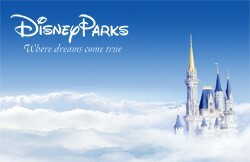 "
The "impossible" includes the creation of over-the-top, overnight experiences for winning guests at both East and West Coast resorts: a royal bedchamber inside Cinderella Castle at Walt Disney World Resort and a Mickey Mouse Penthouse at Disneyland Resort, both expected to be complete by January 2007. A day of royal treatment will end with a night of enchantment inside Cinderella Castle for a different lucky guest each night. Cinderella's royal bedchamber, now under construction at Magic Kingdom, will allow Disney guests to stay overnight inside the park and enjoy a view shared only by Tinker Bell. The lavishly decorated bedroom will be located in a space originally planned as an in-park apartment for the use of the Disney family. And for a lucky Disneyland guest, each night, the all-new Mickey Mouse Penthouse at Disneyland Hotel will pour on the Mickey charm and include magical views overlooking both Disneyland and Disney's California Adventure parks. The extraordinary penthouse will be decorated in all things Mickey, with finishing touches by none other than Minnie Mouse herself. Additionally, special entertainment and programs will be in place at the parks and resorts to accommodate the desire and wishes of would-be Disney Princesses, pirates, adventurers and space explorers. Your Clients will be able to customize their visit to a Disney park to pursue the “Dream Track” of their choice with on-line planning tools and in-park technology to help them become the hero or princess they’ve always dreamed of being.